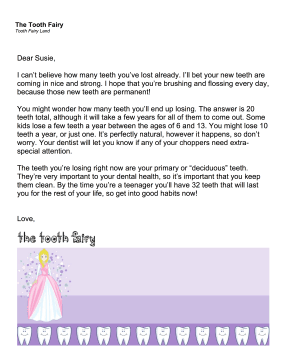 This printable tooth fairy letter answers the question of how many primary teeth children lose. I can't believe how many teeth you've lost already. I'll bet your new teeth are coming in nice and strong. I hope that you're brushing and flossing every day, because those new teeth are permanent! You might wonder how many teeth you'll end up losing. The answer is 20 teeth total, although it will take a few years for all of them to come out. Some kids lose a few teeth a year between the ages of 6 and 13. You might lose 10 teeth a year, or just one. Its perfectly natural, however it happens, so don't worry. Your dentist will let you know if any of your choppers need extra-special attention. The teeth you're losing right now are your primary or deciduous teeth. They're very important to your dental health, so it's important that you keep them clean. By the time you're a teenager you'll have 32 teeth that will last you for the rest of your life, so get into good habits now!